A former mayor who defrauded a friend out of thousands of pounds must pay back more than £52,000. Jawaid Ishaq, 76, from Scunthorpe, forged a power of attorney document in 1997 to gain control of Ali Sultan's bank accounts, profiting by about £66,000. He was jailed for three-and-a-half years in 2015 for fraud and theft. At a proceeds of crime hearing at Hull Crown Court, Ishaq was told a total of nearly £140,000 would be confiscated. Judge Paul Watson QC said the total figure was the result of "his offending and from general criminal lifestyle". He said the first £52,000 "should be paid to the estate of Mr Sultan as compensation within six months" or he would face a further 27-month prison term. Ishaq, a Labour councillor in Scunthorpe for more than 30 years, former mayor of North Lincolnshire and an MBE, befriended Mr Sultan when they attended the same mosque. When Mr Sultan returned to Yemen in 1997 he signed a document granting power of attorney to Ishaq in relation to two properties in Scunthorpe. But a second power of attorney document was drawn up giving Ishaq authority over his bank accounts into which Mr Sultan's state pension was paid, the court heard. Mr Sultan died 10 years later causing the power of attorney to lapse, but Ishaq "continued to receive rent money and pension money until the autumn of 2012", the judge said. 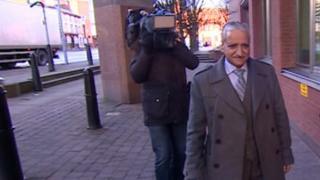 Judge Watson said Ishaq used "the properties and the pensions as a cash cow for his own use". "I note that, even now, he maintains his innocence of any wrongdoing despite the clearest evidence to the contrary."